Stucchi is a globally recognized leader and top manufacturer of hydraulic quick couplings. ISO 9001 certified, this manufacturer has US operations based in Romeoville, IL. Stucchi offers numerous sizes and configurations to meet your varying needs, including Stucchi couplers ranging from 1/8" to 2-1/2" to supply the construction, agriculture, railroad, and many other industries. High pressure connection capabilites of up to 10,000 PSI will meet your most demanding work requirements. Northern Hydraulics is an authorized distributor for Stucchi hydraulic couplings. 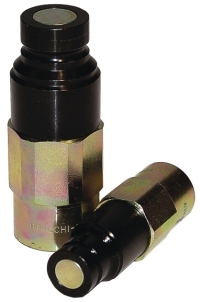 We stock the Stucchi quick couplers approved by BNSF railroad for hydraulic hand tools. Commonly ordered items are F-FIRG 12 NPT Female and M-APM9 Male 1/2" NPT Flat Face coupler. A variety of connect under pressure and push pull style Stucchi quick couplings are in stock with your choice of flat face or poppet style connection. Please contact store at 1-800-823-4937 for information on Stucchi hydraulic products that we can help you with.